Add the flour on a flat service and make a hole in the middle. Add the eggs and mix well until you have a smooth dough. Let the dough sit for 1 hour. Saute sausage and mix with ricotta and parmigiano until smooth. Using a rolling pin, stretch the pasta into a flat, thin sheet. Cut into 2″ squares. Place a small ball of the stuffing in the square and fold into a triangle and then pinch the two edges together. Drop in boiling salted water – when they float to the top they are finished. In a large pot saute the onions in olive oil. Add potatoes and water and simmer until soft. Use an immersion blender to make a puree. Toss the tortellini with butter, sage and parmesan. Make a thin layer of the potato puree on a serving plate and top with the tortellini. Add sage for garnish. There’s nothing like a hearty soup to keep your belly full and spirits high as the weather gets chillier. With Via Umbria’s grab-and-go stock of pantry essentials and dinnertime lifesavers (we’re looking at you, oven-roasted chicken!) it couldn’t be easier to get dinner on the table. This week, tuck into a humble but delicious chicken & farro soup bolstered by flavorful parmigiano and garlic. In a medium saucepan add farro, water, onion, carrot, celery and garlic. Bring to a boil. Reduce heat and cook over medium heat for 30 minutes or until farro is soft. Add more water if necessary. Add chicken, tomato sauce and salt and pepper to taste. Lightly brush asparagus with olive oil and roast until tender. Slice into 1” pieces. Slice the rhubarb into matchsticks. Whisk together the vinegar, olive oil and honey. Toss asparagus and rhubarb with dressing in a serving bowl. Season to taste with salt and pepper. Top with pea shoots and lemon zest. Lightly brush asparagus with olive oil and roast until tender. Slice into 1” pieces. Put arugula in a serving bowl and add strawberries. Whisk together vinegar and olive oil – season to taste with salt and pepper. Toss the arugula and strawberries. Top with dollops of goat cheese and almonds. Steam fava beans for 1-2 minutes (should still be bright green) remove from heat and put on ice to quick chill. Slice portobellos. Whisk together olive oil, vinegar and mustard. Add salt and pepper to taste. Toss together mushrooms and cooled favas. 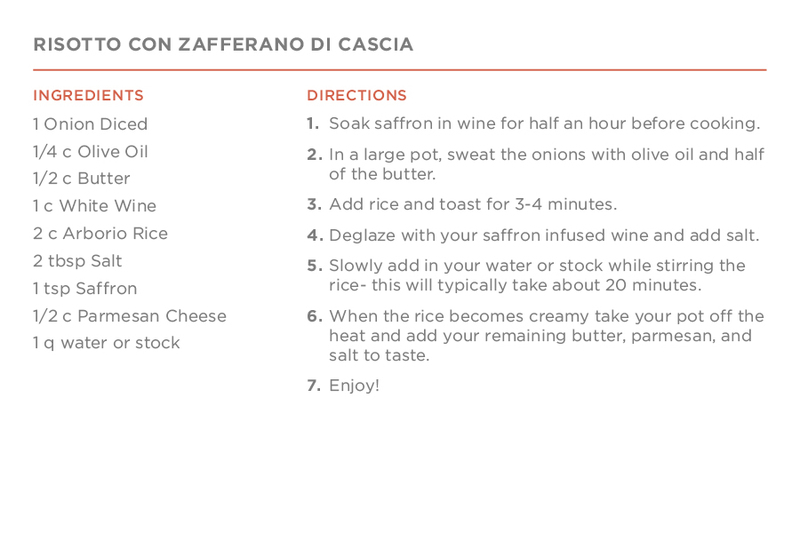 Top with pecorino and serve. This recipe for whole-baked fish with olives comes to us from Elizabeth Minchilli, who enlisted a team of Italian mammas and nonnas to perfect it. After tinkering with her method and recipe for 25 years, she says she’s finally nailed it. The result is a tender roasted fish, flavored with briny green olives and bright, bursting cherry tomatoes. Spoiler alert: this might be our favorite recipe from her new book. –Preheat the oven to 350 degrees F.
–Oil one fish generously, seasoning the cavity with salt and pepper. Stuff parsley and a few olives into the cavity and scatter half of the olives and tomatoes around the fish. Place fish on parchment or aluminum foil and repeat with the other fish. –To serve, place on platter, open the packet, and debone the fish. Pour the juices from the parchment paper along with the olives and tomatoes on top of the fish. In this deceptively simple side, tender asparagus stalks are wrapped in thin, crispy slices of guanciale, a bacon-like cut of cured pork cheek. The clean flavor of roasted young asparagus contrasts beautifully with the salty-savory flavor of our traditional Umbrian guanciale. A note on the ingredients: it can be tricky to find guanciale here in the states, but many specialty grocery stores offer it in their butchery sections—stop by Via Umbria and we’ll be glad to get you squared away. Be warned: arrabiata means “angry” in Italian, hinting at this sauce’s surprisingly fiery kick. While it may look like your classic pomodoro, pasta all’arrabiata is made by infusing peperoncini into a garlicky olive oil, imbuing a subtle heat that punctuates each bite. Served over your favorite pasta, it’s a welcome change that’s quick to make and faster to eat. There isn’t a single event at Via Umbria that I don’t look forward to but the Ivy City Smoked Salmon tasting particularly piqued my interest. I know I’m not alone that for me and my family, smoked salmon is a kind of simple luxury. We enjoy smoked salmon by itself as a snack or for breakfast in our bagels or for dinner in a salad or a pasta. 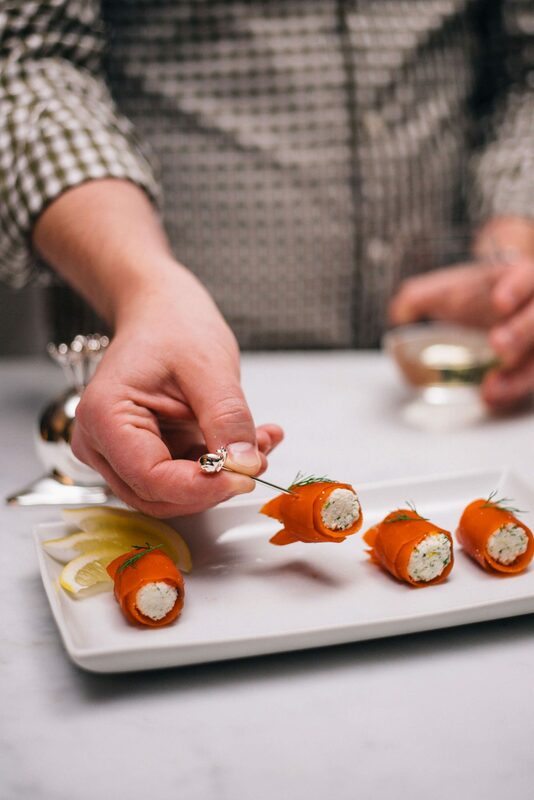 Our affinity for smoked salmon can let us tell you that not all brands are created equal which made Ivy City’s appearance much more intriguing. It was an intimate event which fostered intimate connections. I was seated next to some Via Umbria regulars, and by regulars I mean almost daily customers, whom I had been acquainted with before. As always, conversation flowed freely while we noshed samples of five of Ivy City’s smoked fish paired with a variety of spreads, my favorite of which was a creamy goat’s milk butter. An Ivy City rep explained to us the kinds of salmon we would be tasting which was an educational experience in and of itself. I did not even know there was such a thing as hot and cold smoking! The salmon itself was divine which makes it no surprise that Via Umbria has started carrying it. Three in particular stood out to me; the traditional smoked salmon was superb and as someone who appreciates the classics, I wondered as soon as it hit my lips if there was any way I could send this to my mother who lives 2,000 miles away. This is the kind of salmon that you want on a Sunday morning when you want to feel decadent without leaving the comfort of your home. The other two surprised me, one that had hints of dill and the Ivy City signature “Salmon Candy” which carried notes of honey without being overly sweet. The savoriness of the salmon and the honey played so well together that I only wish I could have more. If you missed the tasting and are in the neighborhood please stop by to take a look at the Ivy City products Via Umbria has started carrying. You will never regret an opportunity to let what Via Umbria has to offer meet your taste buds. For our family, food has always been at the heart of our celebrations. From creating the perfect menu, to shopping for the right ingredients, to cooking the meal everyone joins in, and everyone has inspiration for what we should be preparing. Oddly enough, most of our big ideas and inspirations seem to revolve around fire. Whether we’re roasting a whole lamb over the pit in the backyard, a suckling pig in the magic pig box, or flames shooting out of the grill creating the perfect charr for our steaks, we just can’t seem to get enough of cooking over an open flame. And pizza is no exception. When we renovated our house twenty years ago, we thought long and hard about what to do about the fireplace in the room that we were converting into our dream kitchen. After many rejected thoughts and ideas, a light hearted suggestion from our architect turned into his nightmare as we all quickly agreed that converting the fireplace into a wood burning pizza oven was the perfect solution. And thus, a whole new flavor of family activities was born. 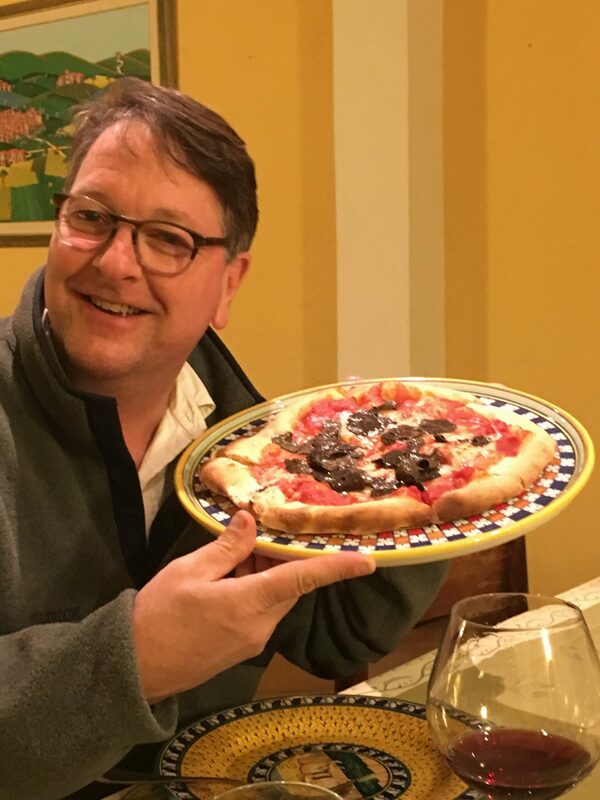 Without any practice at being a pizzaolo, Bill quickly learned the trade and lead the family to pizza perfection. The perfect blend of feast and fun, pizza night at the Menard house soon became a regular event for friends and family alike. The world is your pizza- with an array of choices in front of you- trays of cured meats, fresh vegetables, caramelized onions, sundried tomatoes, fresh herbs, and of course olive oil, fresh pesto and tomato sauce as a base – everyone rolls up their sleeves and tosses a pie or two. Our American tradition of Pizza night has become a fan favorite at la Fattoria del Gelso where fire also reigns supreme. In Umbria – Marco is the pizzaolo. 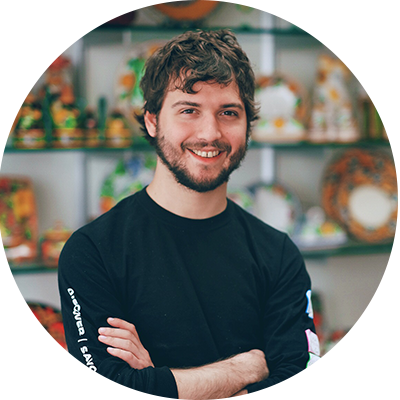 He has perfected the dough recipe and is a master of the perfect bake- creating light and airy pizzas that cook up nice and crisp on the bottom. The tomato sauce is rich without being overwhelming. And of course here we have an amazing selection of toppings –prosciutto, guanciale, salami picante, capocollo, porchetta – and that’s just the meats! A quick word to the wise- the perfect pizza requires a balance of tastes and textures. Too much sauce makes it impossible to cook and too many toppings often leads to an accidental calzone. 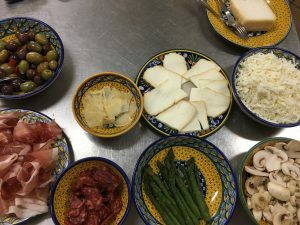 This past Sunday after a beautiful morning hunting successfully for truffles and wild asparagus – it was a great treat to sit back and enjoy a bite of dozens of Marco’s creations. Pizza with sea salt and rosemary, with roaste d vegetables, with crispy guanciale, with Cannara onions and sausage, and of course pizzas with wild asparagus and with fresh truffles. The grand finale? 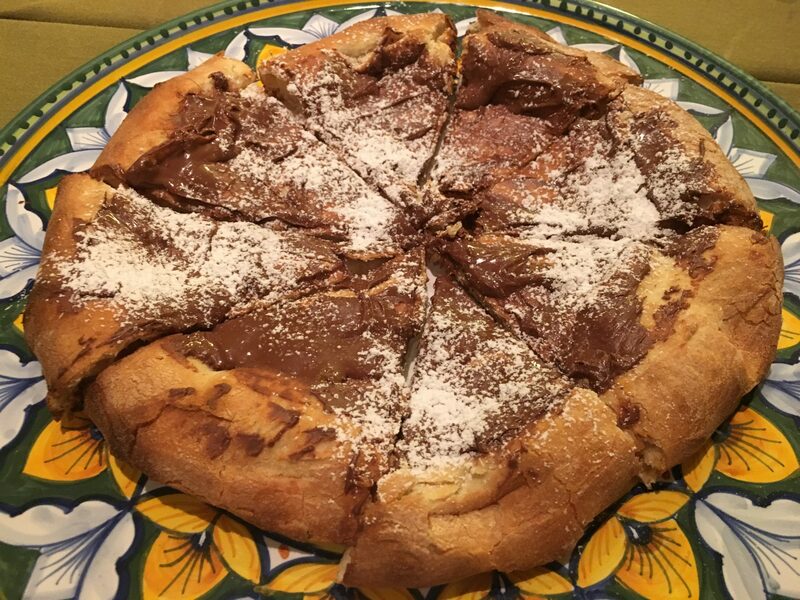 Nutella pizza. But why should we have all the fun? Take a pizza our family traditions and start your own! 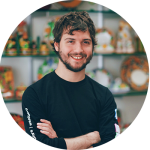 Come enjoy a slice with us at Via Umbria, bring your friends and family for a make your own pizza party, or visit us in Umbria and let Marco take care of you. No matter which way you slice it, you can’t go wrong when you’re eating good food with good friends. Not too long ago, I had my first experience with frenching a rack of lamb. For those of you who don’t know what that means- frenching is a technique in which you “beautify” the meat by exposing the rib bones, thereby making the chops more attractive. Nearly every rack of lamb in the grocery store, as well as beef ribeye, and pork loin goes through this process. While it does indeed make the chops more attractive for plating, and removes quite a bit of fat from the dish, as I was removing the “extraneous” meat from the lamb bones, I felt a pang of sadness. How much goodness we were wasting! Succulent layers of meat and flavorful soft fat was all going to end up in the trash can just for the sake of appearance. Flash forward a few months and I found myself eating in a small restaurant (the where and when of this meal isn’t important) and noticed a framed article from the Washington Post Food section on the wall. The article was an interview with the restaurant’s chef and included a recipe for a lamb roast, the photo of which looked more like a porchetta than any lamb roast I’ve ever seen. But something seemed familiar about it and I couldn’t shake that feeling. When I got home I opened up a few of my meatiest cookbooks and butchery books and found that same recipe in a pop up in few different places- one of which went so far as to call it a lambchetta. 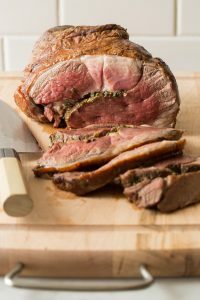 This particular roast was a rack of lamb, but rather than remove the meat from the bones and waste pieces of perfectly good lamb, this roast was based on the premise that only the inedible part of the lamb should be discarded: basically, cut out the bones rather than the meat. What this leaves you with is a “flap” of meat, which is essentially the lamb’s belly, which you then season and roll around the lean loin (the part you are used to seeing as the lamb chop). The first time I made it for myself I kept the seasoning simple, using only salt, pepper, red wine, garlic, and rosemary, but you can really go wild with flavors here. The simple seasoning created flavors that were out of this world, but next time I have visions of testing out a yogurt and feta marinade on the inside. Lambchetta love story aside, this isn’t the end of frenching meats for my case but I am intrigued by and committed to trying out new ways to avoid waste. With this track record, I think that I may be able to stumble into some pretty incredible flavors this way. So why not join me? Stop by the counter and let me know what unique recipes and preparations you’ve tried and love, let’s brainstorm new ways to create amazing dishes, or just give me a call and I’ll make you a lambchetta that will change the way you eat lamb forever. Either way, I have a feeling that the next few months are going to be pretty tasty. It’s the middle of summer and the last thing anyone wants to do in the [sometimes unbearable] heat is spend a long time hovering around the stove to make dinner. Enter Umbrian Lentil Salad–one bite of this vibrant dish and you’ll instantly be transported to the refreshing Mediterranean seaside. This healthy and delicious salad is filled with fresh vegetables–making it fantastic as a snack, side, or light meal. And best of all, it’s simple to prepare! 1. Place lentils and bay leaf in a large pot and cover with 3 inches of water.Bring to a boil then reduce and simmer for 30 minutes. 2. 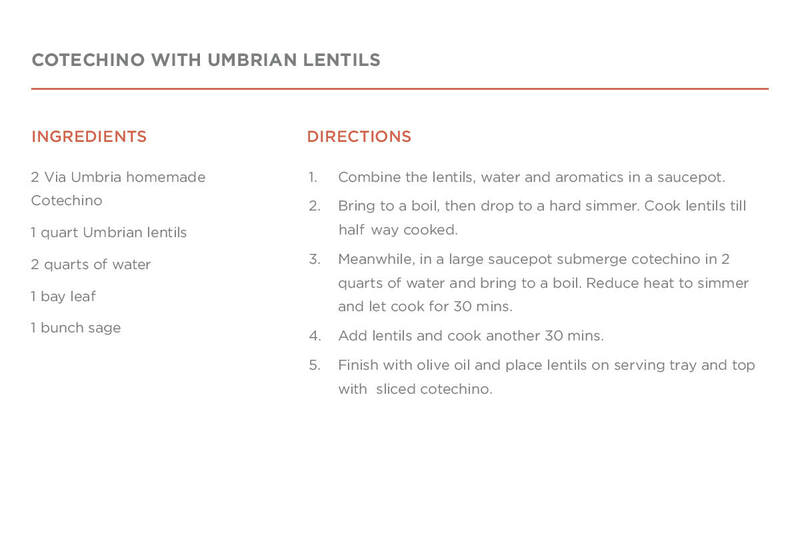 Drain the lentils well and spread them on a baking sheet. Drizzle with vinegar and olive oil and let cool. 3. While the lentils cool, sauté the onion, carrot, and celery together in a pan with a little olive oil until they are slightly soft. Season with salt and pepper. 4. Remove from heat and add herbs. Combine cooled lentils with sautéed vegetables and Feta and stir gently. 5. Refrigerate for at least 1 hour–this is what makes it perfect for a hot day! 6. Serve with a bit of Feta on top. Download a printable version of the recipe here!